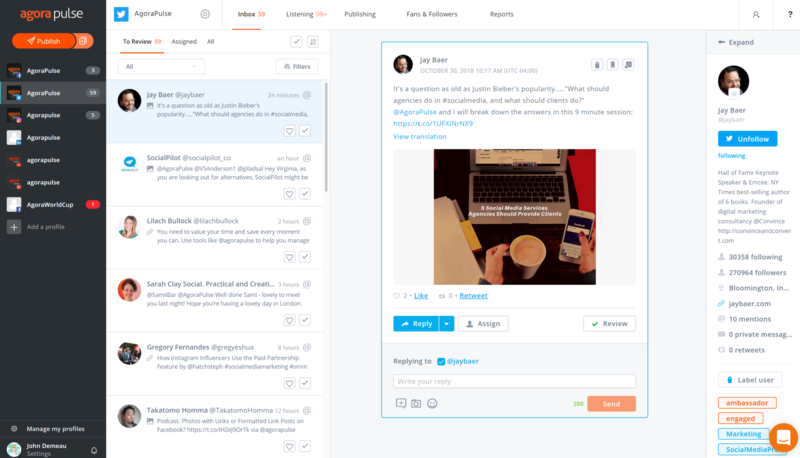 If you are managing social media for other businesses, you need AgoraPulse. If you only have your own business and you only have one page per social media platform, I wouldn't spend the money on it. The reporting covers all the metrics you need and allows you to modify the reports as you wish by downloading them as a PowerPoint file. One of the main things we love about AgoraPulse is that they seem to have high standards for their quality control and customer service. They don't roll out new features unless they work 100% and if there is an issue they are on top of it right away and with ample communication. No more wondering if you've seen every comment or message. AgoraPulse's system allows you to ensure you have responded to every item no matter what the client has done on their end. I would like to see a grid preview for Instagram that allows you to drag and drop the order of the posts. I would like to see the ability to provide a client a link to their planned/scheduled content for viewing and/or approval without the need to make them a member of the team. I would like the ability to create and save hashtag groups for each profile. Usability is the strongest characteristic of AgoraPulse. The feature that pulled us to AgoraPulse was the platform's ability to pull in comments from social platforms, particularly comments on paid ads and posts. Our clients run a large number of ads, and being able to monitor interactions in real time and be assured that no customer was being missed or under-served was the #1 deciding point in our move to AgoraPulse. While Buffer and Hootsuite focus on making the sharing and scheduling of content easy, Commun.it is the only one that actually suggests specific actions you can take in order to grow your account and interact with followers.